If you’re looking to delve into the world of golf, your first order of business will be to invest in some clubs. Golf clubs are the most important pieces of gear you will use, so it’s important to consider your skills and needs. With that being said, you don’t need to spend top dollar on clubs as a beginner. Golf clubs can be incredibly pricey. Not only that, but there are over 40 different types of clubs to choose from. Golfers can carry up to 14 clubs to the course, so the price tag of your gear can add up quite fast. It’s not uncommon for novice players to get overwhelmed with all the possibilities. While experienced golfers often have a collection of shiny clubs they lug to the course, it’s not necessary to be successful. 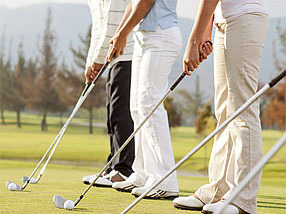 In fact, not having a wide range of clubs can be beneficial in the learning process. New golfers can play a successful game of golf with just half of the clubs that the established players have at only a fraction of the cost. Here are the essential clubs to play golf. The driver will be the most powerful club in your arsenal. It will help you get your ball far away from the tee. Drivers are ideal for long holes with four or five par. It can also be used to hit the ball from the fairway. Technically a wood, the driver is identified with a number “1” located on the bottom of the clubhead. The driver is also typically the longest club in the bag. The longer shaft makes it possible to achieve more power. Older clubs are made of steel, but modern clubs can be made from a variety of materials. Options with a shaft made of graphite or carbon fiber can give you a bigger advantage. They’re lighter and more flexible without sacrificing power. Finding the right driver requires a lot of trial and error. Because it’s the first shot of the hole, it’s important to choose an option that you’re comfortable with. The best driver will provide you with the most distance, but not a lot of loft. In addition to the one wood, or driver, you’re going to need another wood in your bag to offer a bit more flexibility. An additional wood can be used to achieve less distance and a bit more loft than the driver. Typically, an experienced golfer will have up to three additional woods in their bag to offer versatility on the fairway. 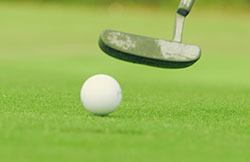 After using the driver to tee off, the wood is used to drive the ball further down the hole towards the putting green. As a beginner, your best bet is to go with a three wood. They are most commonly used on the fairway and often used over a four or five wood. With that being said, they can be tricky to master. While they do offer distance, they don’t offer much in terms of loft. It may take some time to gain experience with the three wood, especially if the shot requires you to drive the ball up an elevated course. Once mastered, the three wood will be your go-to wood. Irons are a versatile club that can get you out of a sticky situation. They cut through grass fairly well, allowing you to get the ball in bounds and onto the green. They also provide a much better loft than a wood to hit the ball high. Iron clubs can range from one to ten, each with varying degrees of loft. Older irons were made from solid iron, hence the name. However, modern clubs feature a steel alloy. Furthermore, newer models feature a back cavity. The cavity creates perimeter weighting around the back of the head. 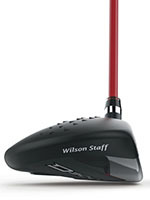 As a result, the club face has a larger “sweet spot” for improved accuracy. It’s good to have a short, middle, and long iron. Having one of each will give you more options to get an accurate shot. Short irons are designed to give you accuracy with minimal distance. They’re best used for shots between 80 and 130 yards. Their main purpose is to provide you with accuracy, which is important at such a close range. As a beginner, you’ll want to go with a nine iron. 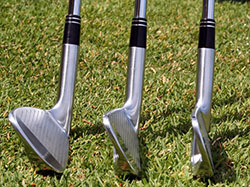 Nine irons are distinguishable with their large club face and steel shaft. The large face gives you a noticeable boost in accuracy. You don’t have to hit the ball in an exact place to get it to go where you want. Additionally, the large face allows you to achieve a higher loft. This makes it possible to get over trees, hills, and more. The steel shaft prevents twisting. This can help to improve accuracy even more. Nine irons typically have a stiff steel shaft regardless of the material used for other clubs in the set. The middle iron is made to achieve moderate distances between 130 and 180 yards. While experienced golfers often have a five, six, and seven iron in their bag, beginners can leave the six behind. A five or seven iron will provide enough leeway to achieve the desired results. While both having both is ideal, you can choose just one to start out. Regardless of whether you choose the 5 or 7, you’ll benefit from a larger club face. The five and seven irons are often used to get the ball off the fairway and onto the putting green, so accuracy is important. In terms of loft, the specific degree usually lies between 28 to 39. This provides a moderate loft that can get the ball onto the green, but not enough to fly over trees. The three iron is all you’ll need. Some golfers choose to have the four iron as well, but newer players can get by with just the three. This long iron is used to hit distances between 180 and 210 yards. It’s often used as the second or third shot on the fairway after the wood. Because they offer impressive distance and loft, newer golfers can have a hard time learning to use the three iron. In fact, many golfers ditch this iron altogether to go with a hybrid model. Hybrids combine the best features of fairway woods and irons into one versatile club. Even experienced golfers opt to go with a set of hybrids instead of the traditional woods and irons. They can be easier to use, but they’re not for everyone. In terms of design, hybrids have lofts similar to woods, but the improved accuracy and perimeter weighting of irons. Whether you choose a three iron or a hybrid is up to personal preference. You only need one to get you through the course. Wedges are a necessity in your golf bag. Originally, wedges were created for the sole purpose of pitching the ball out of a sand trap and onto the green with minimal roll. Today, there are a number of different wedges, including sand, gab, lob, and more. Beginners can succeed with just a traditional sand wedge. Wedges are actually a part of the iron family. However, they’re noticeably different in design. They have the shortest shafts of all the irons, the heaviest heads, and the highest loft. They can be especially useful for hitting the ball high up and onto the green. These clubs aren’t just for sand traps. They can also be used to achieve short distances of 100 yards or less. Because of their unique shape, novice golfers may have trouble with this club as well. The high loft creates a literal wedge shape that hits the ball at a dramatic angle to pitch it upwards. Beginners will need to practice with the right wedge to fully understand how it works and how to make a successful shot. Putters are crucial for getting the ball in the hole. While it may not seem like it, golfers actually use the putter the most during a game. In most instances, golfers will use it about half the time, regardless of their skill level. It’s used only on the green and requires great precision and a light touch to guide the ball to where you want it to go. You’ll only need a single putter in your golf bag. However, choosing the right one for your playing technique is all up to you. There are a plethora of different types of putters available on the market. Each is designed to improve certain aspects of the game or boost your accuracy. For example, some putters have longer shafts for more comfort and striking power while others have grooves on the face to prevent skidding. Most putters also have a slight loft to ensure that any indents on the green don’t affect your final shots. Whichever putter you choose, it’s important to practice regularly with it to ensure that your score isn’t ruined in the final stretch on the green. These seven clubs can help you learn about the game and improve your technique. As you progress, you’ll start to learn more about how the clubs work and how they can be used to dominate a course. Eventually, you’ll want to add more clubs into your bag. But until then, these seven will have you covered.